A rollercoaster of a match, in terms of the scoreline, resulted in a first draw in Phase Two for the Robins after it ended 2-2 at Maes Tegid on Friday night. 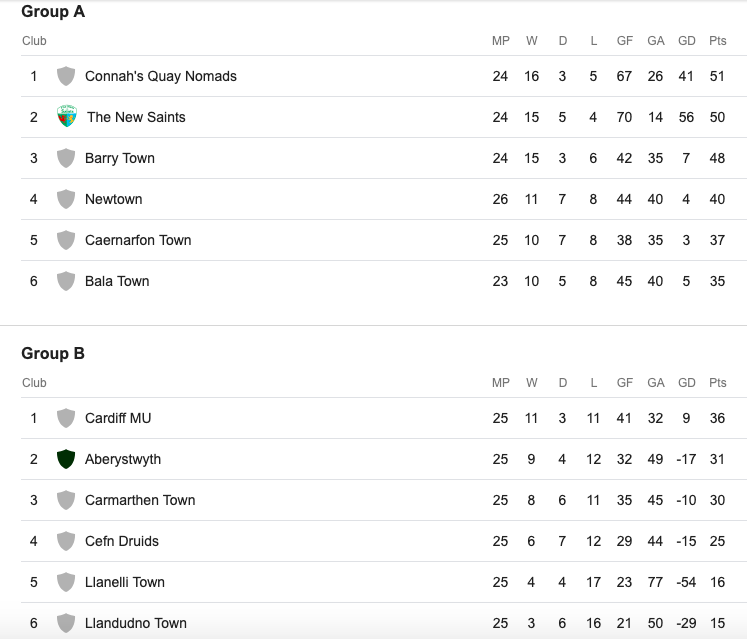 First half goals from Newtown’s captain Craig Williams and Callum Roberts helped the visitors turn the scoreline around from 1-0 to 1-2 until a second half equaliser from Kieran Smith denied the reds a 2nd consecutive win in the JD Welsh Premier League. The result keeps Newtown five points ahead of Bala in fourth place but the Lakesiders do have three games in hand over the Robins. The trip to Bala will be Newtown’s final match before they have a two break from the league. 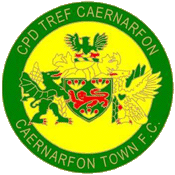 Manager Chris Hughes made three changes to the starting line-up from his team’s 3-2 win over Caernarfon Town. Luke Boundford, Jay Denny and Sam Phillips were placed on the bench while George Hughes, Neil Mitchell and Steve Leslie returned to the starting 11. 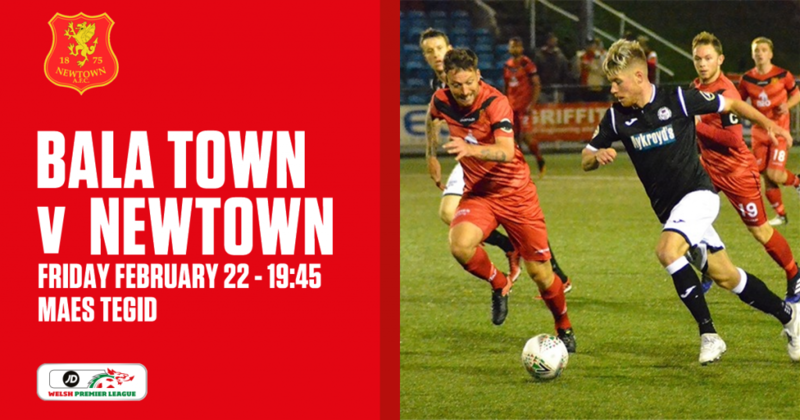 The Robins were up against a potential rusty Bala Town group as Friday night would be the host’s first match in the JD Welsh Premier League in nearly four weeks, and their previous fixture was at the end of January when they defeated Haverfordwest County in the Welsh Cup. Both sides began the match with five points separating the two sides with Bala Town having three games in hand after a number of their matches were postponed/rearranged. But all of that was forgotten come kick-off as the opening half was a tight affair between the two. After the match had only reached being seven minutes old, the Robins had their first effort up front when captain Craig Williams delivered a free kick into the box finds Nick Rushton before his attempt is saved by Bala’s goalkeeper, Ashley Morris. Just a couple of minutes and the visitors nearly caught the Bala defence napping when Callum Roberts provided a long cross from the wing who just missed out on unmarked Porya Ahmadi in the box, as Morris beats him to it. 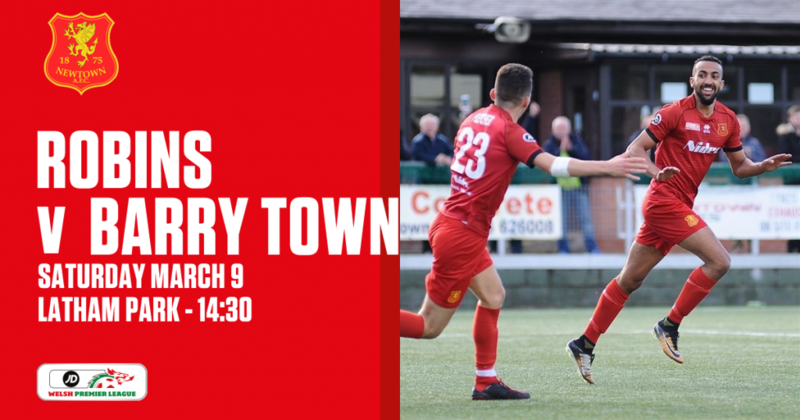 Bala started to respond to Newtown’s early efforts on the 13th minute when Steven Tames picked up a forward ball past the Robins backline, but was caught offside with his effort missing the target in the process. But it would only be three minutes after the events of Tames’ effort that would see Bala take the lead after 16 minutes. It was Kieran Smith that would put the Lakesiders ahead. The number 11 slotted the ball into the corner of the net after completing Tames’ short pass in the penalty area. Last Saturday’s 3-2 win over Caernarfon Town for Newtown looked to be the inspiration for the rest of the opening half. The 20th minute mark saw Williams take his first set piece of the game which had to be cleared off the goal line as a warning to the opponents of what he is capable of from long range. Three minutes later had Ahmadi try for goal with a tight angled shot from the edge of the box that had to be saved by Morris. But before the match clock reached the first half an hour, Newtown equalised thanks to another cracking set piece kick from Williams. The skipper smashed the ball from the wing position of the free kick and it was enough power to get the ball past the finger tips of Morris. 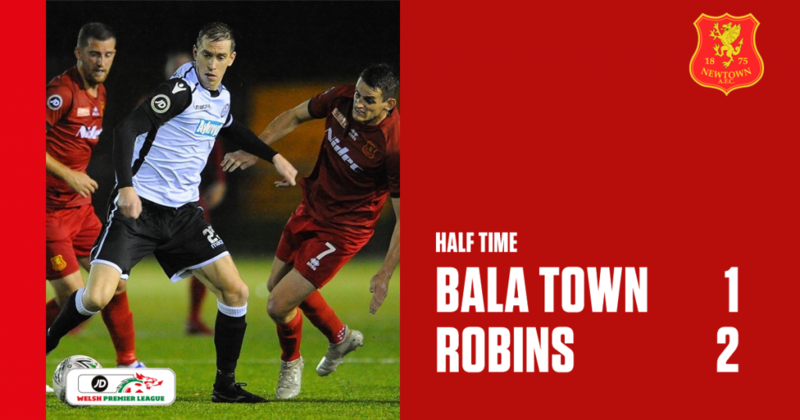 Nine minutes before the half time break, the Robins turned the game around as Roberts drilled his shot from close range. And it was a scintillating cross from the wing to make it happen too. At the beginning of the second half, the hosts made a double substitution as the Lakesiders manager, Colin Caton, was determined to try and change things around quickly at Maes Tegid. Ian Sheridan and Evan Horwood went on to replace captain Chris Venables and Nathan Burke. Venables did receive a yellow card early on in the first half. Bala created their first chance since the interval as a drilled shot from unmarked Anthony Stephens went just a whisker over the top of the bar. Then it was Newtown’s turn to attack for the first time in the second half, the visitors were looking for that gap to grow in the scoreline. Last week’s winning goal scorer, Alex Fletcher, picked up the ball well in midfield to setup Ahmadi from the edge of the box who hammered his shot over the bar. From our angle, it wasn’t far off from Ahmadi. Newtown’s opportunities would prove to be costly come the 68th minute when Bala produced a dangerous cross that would go across the face of goal, this all taking place seconds before substitute Horwood assisted the host’s equaliser by crossing the ball for Henry Jones who headed in their second goal of the night. The match would wrap up in what looked to be a game of two halves with Newtown looking to be at the top in the opening 45 minutes before Bala showed a lot more involvement up front in the second half. Bala Town: 1. Ashley Morris (GK); 2. Andrew Burns, 3. Sean Smith, 6. Anthony Miley, 5. Stuart J Jones, 21. Anthony Stephens, 8. Nathan Burke (12. Evan Horwood 45′), 25. Chris Venables (C) (10. Ian Sheridan 45′), 7. Steven Tames, 77. Henry Jones, 11. Kieran Smith (19. Shaun Kelly 69′). Substitutes: 15. Rob Pearson, 19. Shaun Kelly, 10. Ian Sheridan, 12. Evan Horwood (GK), 30 Keighan Jones, 20. Joe Edwards, 22. Josh Jones. Newtown AFC: 13. Jack Perry (GK); 19. Craig Williams, 26. Sam Barnes, 5. Kieran Mills-Evans, 3. Callum Roberts, 23. Alex Fletcher, 18. George Hughes, 8. Nick Rushton (11. Joe Kenton 90+3′), 7. Neil Mitchell, 10. Steve Leslie (6. Jay Denny 72′), 32. Porya Ahmadi (9. Luke Boundford 84′). Substitutes: 9. Luke Boundford, 6. Jay Denny, 17. Sam Phillips, 11. Joe Kenton, 25. Will Evans, 21. Dave Rose.